Changing the front rotors on W123s are much more involving than changing the rear ones. The front rotors are bolted onto the hub from the inside and the whole hub with bearings and everything have to come off. The job is not difficult but needs some preparations with tools and grease. 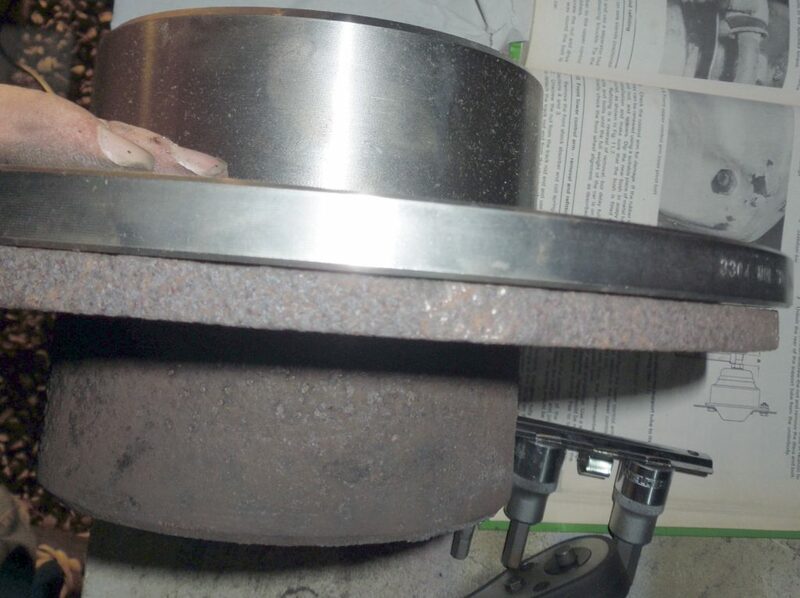 The rotors should be changed every time there are large scoring, a big edge lip, excessive rust or they have been overheated and warped. The good thing about this job is that you can change the front hub bearings (which is of an open type) at the same time! 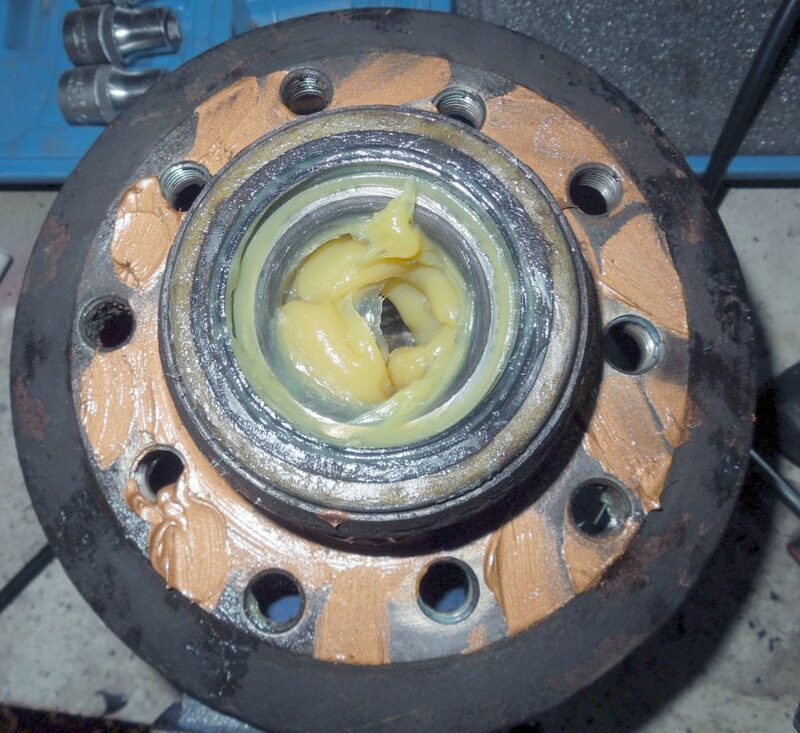 The bearings should be re-greased at set intervals and changed when there is play in the hub. Ideally you would need a dial indicator tool, which is just a dial fitted on the hub while you are pushing and pulling on the rotor that tells you the end play. I would recommend this if you are planning to do bearing inspection and replacement often. For the front bearings it is not really that crucial. It is much more crucial on the rear bearings which are closed types with much less tolerance in the bearing play, these rear ones cannot be easily adjusted when setting the final end play. Fore time reference I used around 6 hours to change all four brake rotors on the car, where it took more than 4 just for the more involving front ones. Cleaning off old bearing grease and loosening rusted bolts takes up most of the time. Pipe tools and with hex bits for removing the rotor from the hub. Start by jacking the car up and put on jack stands. Its fine with only jacking the front up, your choice, but remember to engage parking brake and use wheel stoppers to prevent the rear to start rolling. 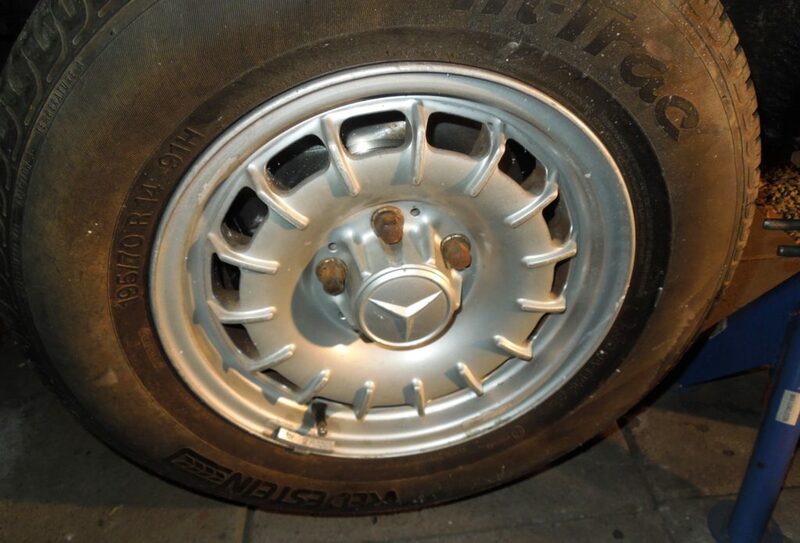 Remove your fine rims and wheels. Now is also a good time to clean them really good on the inside! Ohhyeah..
Now the wheels are off you have to start cleaning brake dust before you start doing anything else. Use a dust mask, grab a brush and lots of soapy water and start cleaning the caliper, the disk and hub and around the immidiate area. This is to bind the dust to the water so you will not inhale it later. Start by removing the brake pads, throw these away. Then go ahead and unbolt the two caliper bolts, hang the caliper in some zip ties or string up in the wheel well for easing tension off the flexible brake hose. The front calipers are quite heavy so prepare the zip ties or string before you loosen the last bolt. Now is the time for removing the front wheel hub. The exciting part. That black metal cap on the tip of the wheel hub is the hub grease cap. It needs to be removed. It is just pressed on the tip and, you can remove it by using a hammer and a chisel, just knock carefully on the little edge outwards, repeat by turning the hit point, then the cap would move outwards until it pops off. Once the grease cap is off. you can see inside and there is a spring which is the ground conductor for the brake pad sensors and the hub tightening screw. I have seen these springs broken since they are quite fragile, and they have to be intact for the brake pad sensors to work. Remove it by pulling it straight out with some thin pliers. Then loosen the hexagon screw on the wheel hub locking nut. Be sure to count the number of turns it takes to take it off then write it down. This number is the reference for the wheel hub play, when you don’t have a dial indicator it is very nice to know, although it might need to be adjusted when reapplied new grease and new bearings. Hub locking nut. Don’t forget to count the number of turns. When the hub bearing lock nut is loose, you can take off the outer bearing and also grab the brake rotor, just pull the whole hub assembly off. Now it is time for cleaning, the most time consuming part of the whole thing. 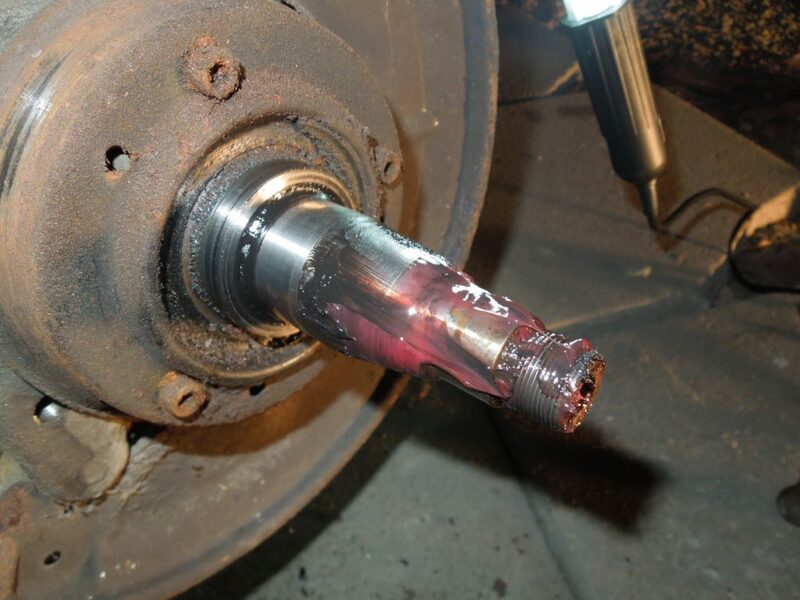 Clean the old grease off the hub. 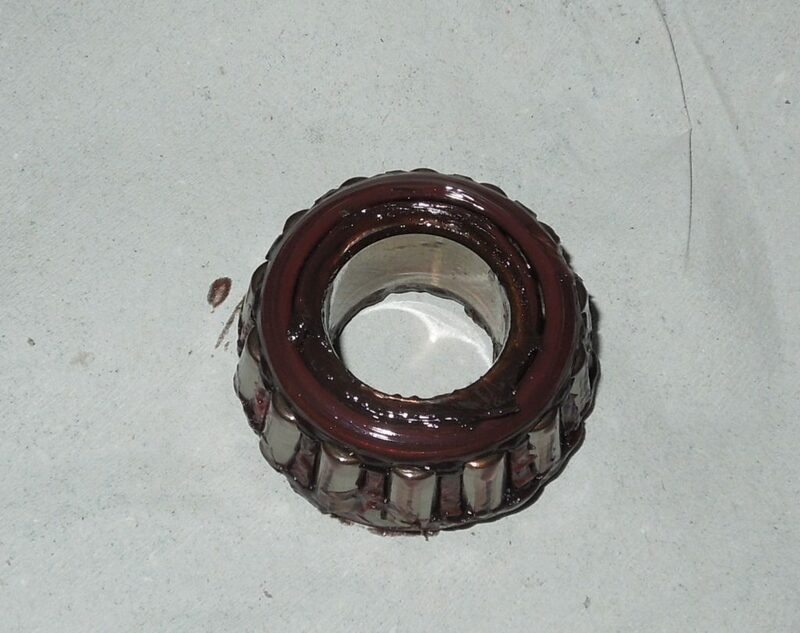 Also clean the old grease off the outer bearing if you plan to reuse it and look for wear. If any scoring is evident on the bearings, just replace them. Use lots of brake cleaner and let it soak before going crazy with shop towels. Place the old brake rotor in a wise and tighten it really hard, I mean so hard you are able too. Use the large breaker bar with the hexagon pipe and crank off all the five bolts holding the brake rotor and the outer hub together. They usually have rusted tight to the rotor and they also have thread locker. Place old rotor in the wise and loosen the really hard bolts. Even after the bolts are off the rotor and hub might be fused together. 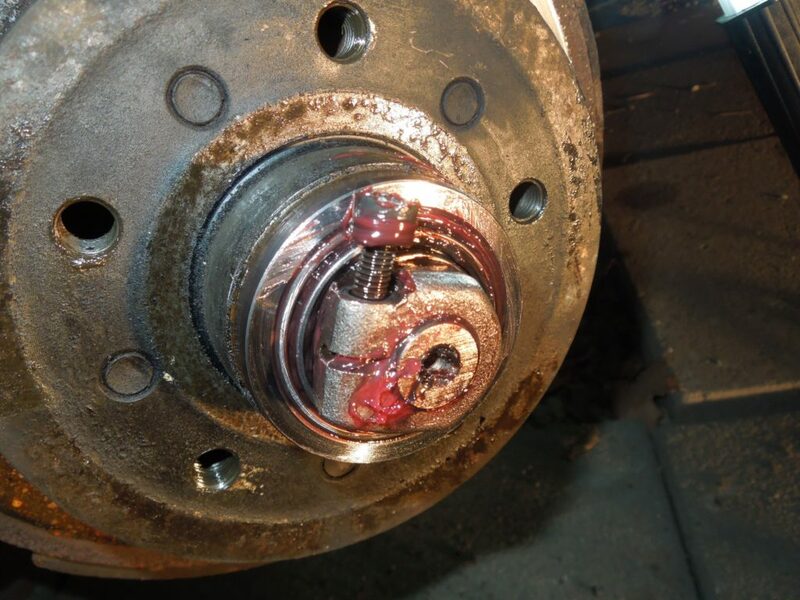 You may need to bang the hub free with a hammer to fully loosen it from the rusted brake rotor. Then clean the hub free from the old grease and reapply with new bearing grease if you’re not planning to change bearings. 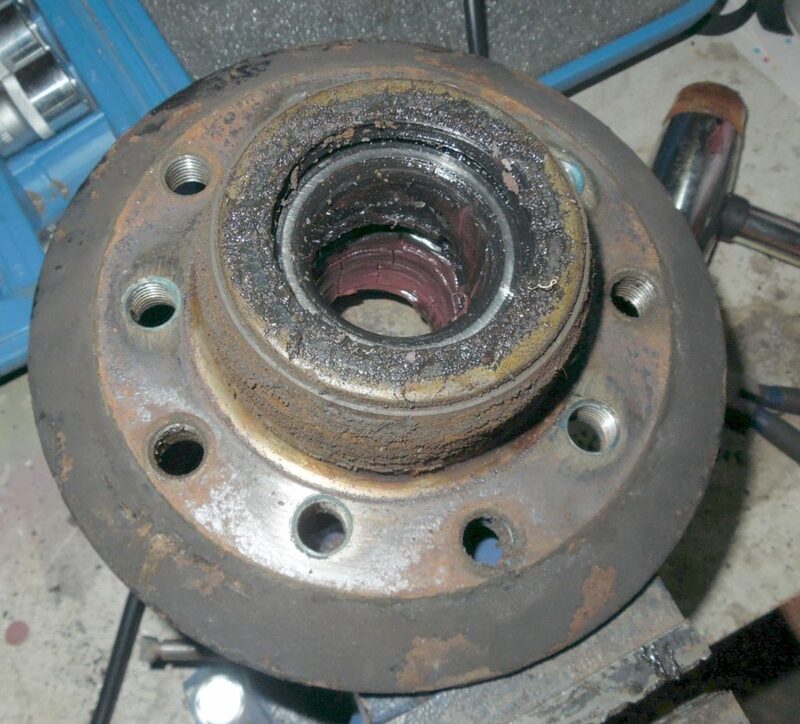 If you are changing the bearings, the inner bearing have to be knocked out of the hub by using a socket which will just fit inside the hub. Ideally you should use a brass punch tool, but since most of us don’t have this exotic equipment then go for the socket. The socket will ensure evenly force distributed over the bearing race. Making sure that everything is very clean, of the hub and inner hub. The inner hub bearing can be driven in by using a same sized socket as the bearing itself, make sure you hit it so it will go in perfectly straight, this might be a bit tricky at first, but when its a bit in the rest should be easy. 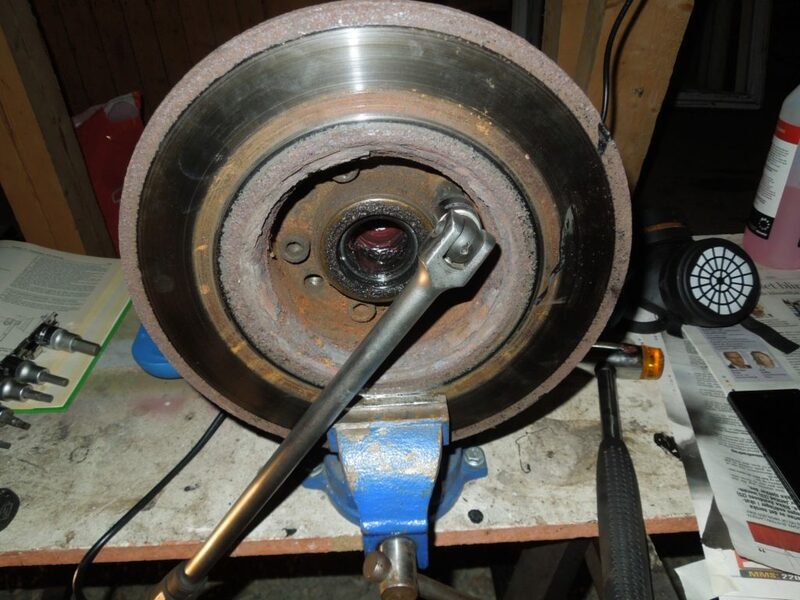 Do not hammer directly on the race of the bearing since it will be broken. Start by reapplying bearing grease. Fill around 2/3 of the round hub with new bearing grease otherwise it might be tricky to get it on the spindle. Also apply some brake pad grease between the surfaces of the hub and the rotor to prevent seizing. Use some thread locker on the rotor bolts and tighten the bolts to 114Nm with a torque wrench. 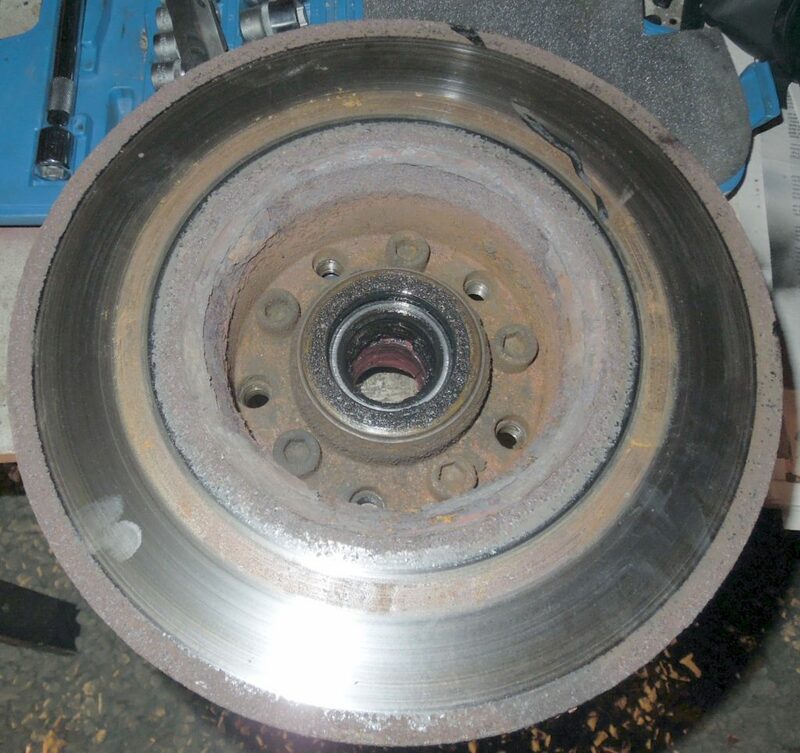 Be sure to not put the new brake rotor in a wise without some protection of the rotor surfaces. THIS PART IS VERY IMPORTANT! 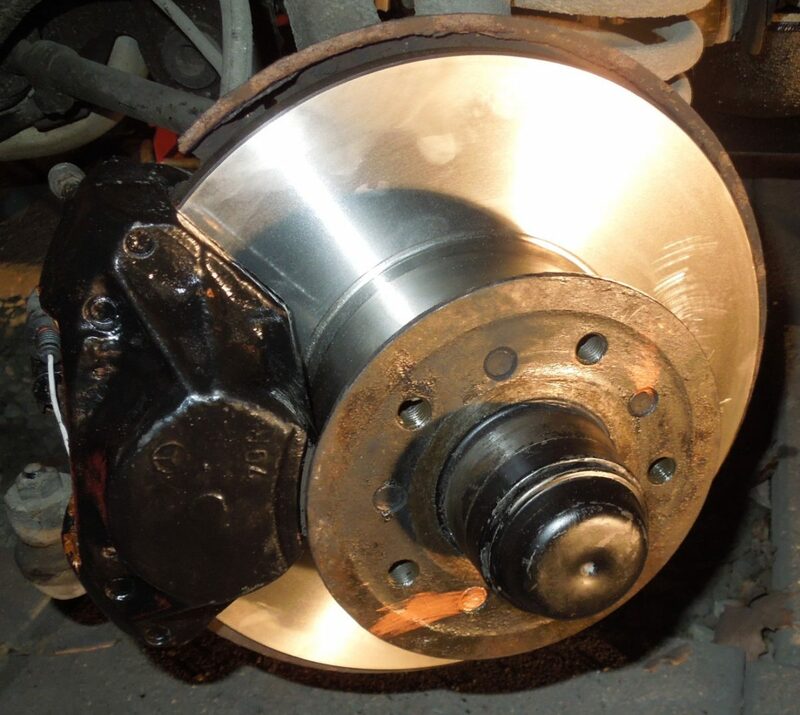 The brake rotors are coated in some anti rust protective layer that will make your brakes pretty much useless unless you clean the rotor surfaces with brake cleaner before you fit them on the car. Be sure you remember this before you put them on the car, and clean them properly, you can feel the stickiness goes away and it feels more like bare metal. Slide the outer hub and rotor back on the spindle, place the outer bearing in too before tightening down the wheel hub with the tightening nut. Turn it as many turns as you counted before, then check the looseness with wobbling the brake rotor back and forth. 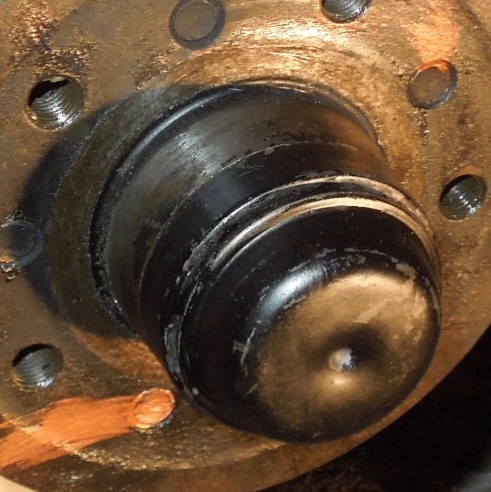 If any looseness is apparent then tighten the nut slightly so no apparent looseness can be felt.It is important to not over tightening the hub since it will overheat. Ideally you should use a dial to get the exact manufacturer setting. Secure the tightening nut and place the little ground spring in place. 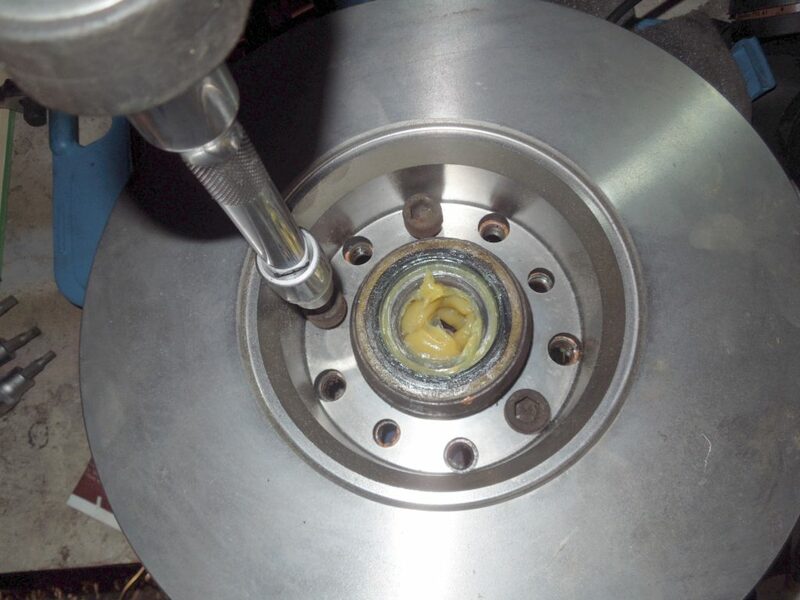 Fill the grease cap with some bearing grease and tap it in place carefully with a rubber hammer. Don’t forget to put on the brake calipers on and placing some thread locker on the bolts before you tight them down to about 110-114Nm. At last before the wheel goes in put in the new brake pads and replace rattle springs or pad sensors if needed. Then put the wheel back on and repeat the whole progress again on the other front wheel. Hopefully it takes less time than the first one.